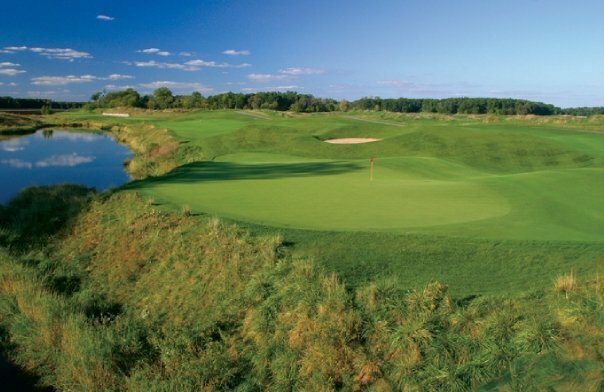 Most people might not think of Michigan as being one of the best places to play golf, but they would be missing out on some tremendous golf courses. In this article, we will be showcasing the best golf courses in Michigan that should be on your short list of places to play. One example would be the top-rated, Eagle Eye Golf Club located just North of East Lansing. It was the top-rated course in Michigan in 2014. Another example would be the Forest Dunes Golf and Country Club in Roscommon, which was rated as the #2 rated course in Michigan in 2014. Chris Lutzke worked with Pete Dye to design this links style championship golf course that features magnificent shot values on every hole. This course features five sets of tees that are challenging for any level of golfer. The signature hole on this golf course is # 17 that features an island green. From the back tees, it measures to be 7308 yards and can be as long and difficult in comparison to other courses around the country. The other four sets of tees offer generous landing areas that will allow every golfer to enjoy the challenge. Along with Hawk Hollow, Eagle Eye Golf Club has been the host site of the Michigan PGA Championships since 2008. Forest Dunes Golf and Country Club, designed by Tom Weiskopf in 2002, is nestled on 500 acres of heavily wooded land within the Huron National Forest. To quote Tom Weiskopf, “Forest Dunes replicates classic style and emulates a risk/reward involvement on most every hole. I consider this golf course to be in the top three which I have been involved with in the United States.” This course features wide open meadows, hardwoods, century old jack pines, rugged native dunes, scruffy sand areas, and water features. The premier hole would be considered the par 4, 17th, that has dramatic native sand dunes framed by fescue grasses, which offers a number of ways to be challenged. If you would like to stay and play, the Lake AuSable Lodge features 14 well-appointed lodge rooms overlooking beautiful Lake Ausable and the golf course. Consistently ranked as one of the top 25 golf courses in Michigan and also garnering the 40th ranked public course in America by Golf Digest in 2008, Red Hawk offers a beautiful, tree-lined setting bordering the Huron National Forest in the quaint, small town of East Tawas in the Northeastern portion of Michigan. This Arthur Hills design, which opened for play in 1998, offers tee options for players of all skills sets with four sets of tees available ranging from 4883 to 6589 yards so you can play from where you are most comfortable or adopt the PGA’s new slogan of “Tee it Forward” and have some fun. Beautifully manicured bentgrass greens and fairways, a great practice facility with target areas, a large putting green, and a fully stocked pro-shop with name brand equipment and apparel are all part of the lure of Red Hawk. With extremely affordable rates (averages around $40-60 in season) and a picturesque setting worthy of the accolades, it is no wonder than Red Hawk is recognized as a true hidden gem by the locals. We know you’re ready to book your golf trip to Michigan, but before you do don’t forget to stop by 3balls.com before you leave so you can order the perfect used Scotty Cameron putter, Certified Pre-Owned Titleist driver or new Ping irons. We’ve got all the gear you’ll need for the challenging and beautiful courses Michigan can throw at you at prices that won’t break your vacation budget.